In an effort to fight hunger and poverty, Caribbean churches are creating agricultural projects that provide sustainable, ongoing ways to provide nutrition for children and families. Currently churches in Haiti (the third-hungriest country in the world, behind Somalia and Afghanistan) are answering their country's food crisis through goat projects and community gardens. The goat husbandry project currently provides nutrition for school feeding programs and families in need in each of the country's 11 districts. 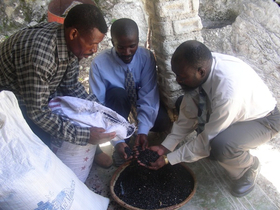 The goal of NCM Haiti is to expand this project to more local churches throughout the country. The church gardens also provide a way to create sustainable crops that will continue to feed those in need for years to come. Your gift of $25 will buy seeds for one crop in a garden. Your gift of $75 will purchase a goat that will breed to provide more goats who can provide milk and nutrition for children and families. Your gift of $500 will provide seed for a variety of vegetables in a community garden and tools for community members to work the garden. Be sure to put ACM1861 in the Memo area. Thanks for your donation.